It would seem as if the demise of The Vehicle Production Group, the now-defunct manufacturer of taxis and vans that received $50 million in government loans, is solely a tale of losers. But at least two big winners were involved: New York State Assemblyman Micah Kellner and his wife, who got a lot of money and a job from the ordeal. 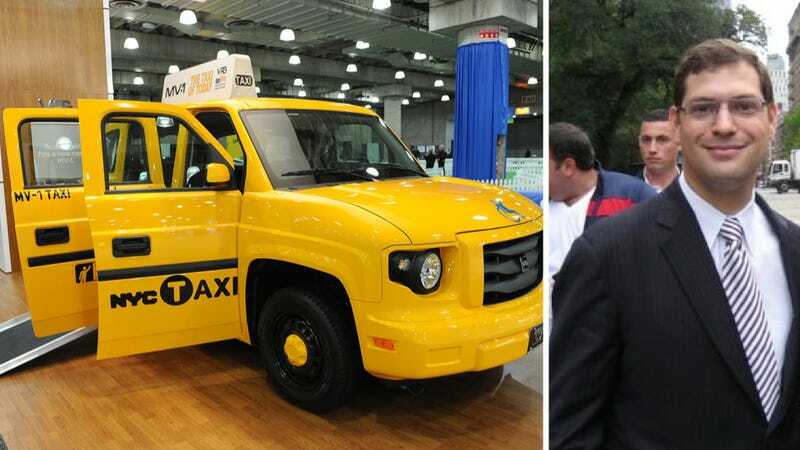 The New York Post reports that Kellner, a Democrat who is now running for the New York City Council, vigorously challenged the city's approval of the Nissan NV200 as the "Taxi of Tomorrow" and pushed hard for approval of VPG's MV-1 as an alternative. And why wouldn't he? Kellner himself suffers from cerebral palsy, and one of the highlights of VPG's MV-1 taxi is that it was wheelchair accessible from the start, while the Nissan was not until fairly recently. Even those stuff wheelchair-bound fares in the trunk. Oh yeah, and there was also the matter of how Kellner received $22,800 in donations from VPG and its executives, according to the Post. Board chairman Fred Drasner also donated $2,750 to Kellner's city council campaign. But perhaps what is most cringe-inducing about this is that VPG paid $90,000 to Dan Klores Communications for lobbying services between November 2011 and April 2012, and in that last month the firm hired Kellner's wife to be its vice president of government affairs. Not a bad deal at all, if a questionable use of our tax dollars. VPG received $50 million in loans under the U.S. Department of Energy's Advanced Technology Vehicle Manufacturing program. They were one of just five companies to be approved for such funds. While VPG had produced about 2,500 body-on-frame MV-1 vans at the old AM General Hummer plant — which could also be configured to run on natural gas — they have since ceased operations and laid off their staff. Kellner was successful in getting VPG approved as an acceptable model of taxi for the city's medallion companies, but that's kind of a moot point now that they aren't being made anymore. It's all just one more questionable aspect of the ATVM loan program, as well as New York's Taxi of Tomorrow, which continues to be fraught with criticism and litigation of its own. Your tax dollars and mine, hard at work.